This mass ﬂ ow controller/meter driven by a 24 VDC power supply has been developed as a successor to the MODEL8300. 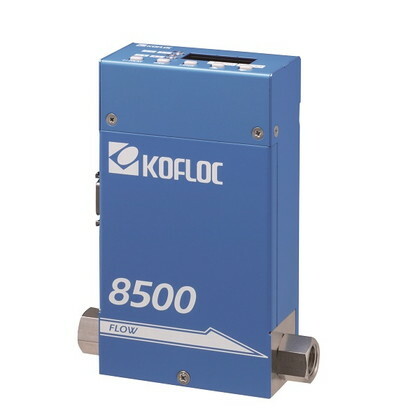 ・The high-lift actuator allows this compact model to control a large ﬂ ow rate. ・The RS232C/RS485 communication function and integration function are provided as standard equipment. ・The 14-bit converter permits display and operation in 4-1/2 dig-its. ・Control of the ﬂ ow rate of inﬂ ammable gas is possible, because the heat generating part of the sensor is not exposed to gas. ・There are no limitations on the mounting position that may be employed. ・In addition to SV setting, ﬁ ve other patterns can be set. ・Auto zero and auto close functions are also standard. ・Select the input/output signal from (1) 0-5 V and (2) 4-20 mA when placing an order. ・Please contact us for the 8550 type of 30-100SLM.